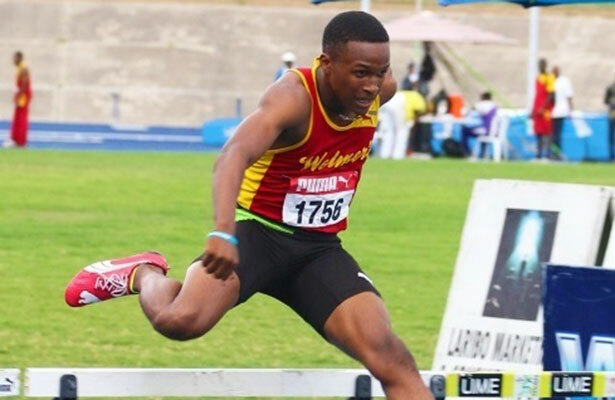 Reigning World Junior 400m hurdles champion and 2013 World Youth sprint hurdles champion Jaheel Hyde of Wolmer’s Boys School in Jamaica took a chunk out of his own record in the 400m hurdles open for Boys at the Boys and Girls Athletics Championships (Champs) in Kingston last night. His run was the feat that headlined a number of fine performances on the fourth day of competition at the 105th staging of the championships that has launched almost all the careers of Jamaica’s elite athletes. Hyde’s time of 49.01secs erased the old mark of 49.49, which he set in 2014, and broke the Jamaica junior record for the event. It was only his fourth 400mH race this season, which he began in January after having played soccer for his school last fall. The versatile student-athlete roared from the blocks and attacked the first hurdle with purpose, leaving the rest of the field in his wake. Hyde now looks to cop the double today, when he clashes with formidable World Youth 200m champion Michael O’Hara in the Class One Boys 110m hurdles, an event for which Hyde has the leading time this season. At the end of the penultimate day of competition, it was O’Hara’s school, Calabar that was in command of things with 116 points after 17 finals. They were 23 points ahead of archrivals Kingston College (KC) on 93. Jamaica College (JC) was in third with 90, while St. Jago and St Elizabeth Technical High School (STETHS) rounded out the top five with 65 and 47 points, respectively. After the 1500m race, KC jumped from third into the lead with 66 points while Calabar was on 64 and JC on 53. But Calabar made a haul of 35 points in the 100m alone to snap back into the lead. While their duo of Chadrick Stewart (11.73) and Rosean Young (11.74) finished seventh and eighth in the Class Three 100m for a mere three points, their tank-like built Dejour Russell came from behind to defeat his teammate and hot favorite Tyreke Wilson in the Boys Class Two 100m with 10.67 (-2.0mps). Wilson was second in 10.76. In the very next race, the Class One 100m, O’Hara left the blocks late but ran like a long-striding African Onyx in full flight to win in 10.42 into a 2.6mps headwind ahead of his fast-starting teammate, Edward Clarke with 10.50. Third went to Raheem Robinson of Wolmer’s Boys in 10.61. On the girls’ side, St. Jago High captured three of four 100m titles. The spoiler of the St. Jago party was Shellece Clark of Edwin Allen in Class Two. The dangerous and powerful sprinter was late out of the blocks but overhauled the field to stop the clock at 11.81secs (-2.1mps). Yanique Dayle of Hydel and Kimone Hines of Green Island were second and third in 11.94 and 12.03, respectively. Clark noted that she ran the race for her teammate and favorite for the Class One gold, Saqukine Cameron, who was disqualified for false-starting in the heats and wept uncontrollably. At close Friday, Edwin Allen led the girls’ top-five standings after 20 finals with 131.50. Next were Hydel High (113); St Jago High (86.33); Holmwood Technical High (75); and Vere Technical High (46). First to go was the Class Four girls sprint relay. A superfast Edwin Allen clocked 46.9 in the heats to erase last year’s 47.28 set by St Jago High. Calabar’s Lamar Reid, who is a Class Four athlete, broke the 22-year-old Class Three high jump record of 1.98m set by his schoolmate Ryan Chambers in 1993. He cleared the bar at 1.99m on his second attempt.